Healthy eating is not a tough task, is it? In fact, if you are a health freak and addicted to a healthy lifestyle, there is no looking back! A healthy lifestyle is quite within reach! So what is the best way to stay healthy? The best way to stay fit and healthy is to make some lifestyle changes and exercise regularly. Of course, you cannot expect to keep fit if you continue with unhealthy lifestyle choices, including smoking, drinking alcohol, abusing drugs, overeating, and making bad food choices. Healthy Eating Tip 1: Why do we eat curd after meals? If you are looking for healthy eating recipes, please join our facebook food group Healthy Recipes by Homemakers, where we share healthy food recipes. Now let's come to the issue why curd should be eaten last - curd counters drowsiness & flatulence caused by food. Probiotics in curd aid in digestion of food and act as an antidote to constipation and nonutilization of food in the body. Curd intake quenches thirst and prevents water intake immediately after food. This indirectly facilitates cholesterol diffusion. It helps many people intolerant to certain foods to avoid allergic reactions. It raises alkaline effect and reduced acidic effect of food. Also, curd has a cooling effect on your body, which otherwise gets warm after food intake. When it comes to healthy eating tips, Ayurveda has some reservations regarding milk and fruit combination, which may affect those with chronic cough & asthmatic conditions. It does not affect everyone. Milk along with citrus foods may cause cough. But curd is different from milk. It has no calories and is full of probiotics that help in digestion. Apple, as a fruit, has a unique distinction that it is made more of roughage than water content. This means the roughage in apple is not absorbed in the curd, nor does it affect the quality of curd. It does not react with curd. Therefore apple +curd combination works fine. You can combine any green fruit with curd (not with milk). Moreover, it all depends on your health condition and how your body reacts to certain food combinations. Make sure you combine those fruits/foods that will not absorb curd, nor affect its status. Means both will not affect each other's properties. For e.g. green mango can be safely used with curd, but you cannot say this about ripened mango. You can use pomegranate, pineapple or apple, as they do not soak curd properties and remain unaffected by curd. Your healthy eating plan should have no place for Dalda! Here are some facts why you should avoid this vegetable oil. Healthy Eating Tip 3: How often do we need extra calories? Calories remain in the body for a short period. They turn into fat 8 hours after consumption. Intake of calories depends on your activity level. If you have excess fat and need to tone up your body, you do not need to have extra calories. But if you need to build muscles or are feeling weak after usual activity level, then you should consume more calories than burning the same. When you take rest after work/ burning calories, the body undergoes a process called supercompensation. It uses fat deposits to re-energize the body. If you eat more than required, fat will remain. If less, fat reduces. Here is a calculator to measure your required weight, calories per day, and BMI. Healthy eating tip 4: Why choose whole wheat flour to refined flour or only wheat flour? When you are charting out a healthy eating plan, you must learn to differentiate between whole wheat flour and wheat flour. Of course, refined flour should have no place in your meal charts.Eating healthy is a game changer for sure, and a balanced diet will help you stay fit. 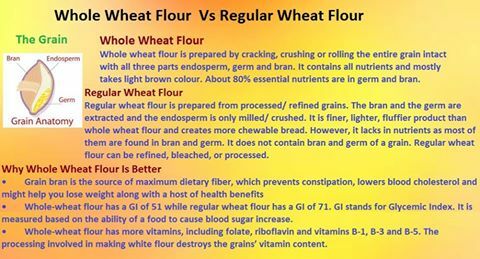 There is so much of stuff in the market which is being marketed as being healthy, including wheat flour. In a layman's terms, wheat flour is common wheat. When you are following a healthy eating plan, you ought to understand the difference between whole wheat and regular wheat flour. Healthy eating tip 5: Why Say no to Canola Oil? Canola oil getting a strong foothold in the market after frivolous marketing campaigns, especially in Punjab. The biggest worry is Canola oil is 100% GM food. Additionally, canola has higher amounts of pro-inflammatory omega-6s relative to anti-inflammatory omega-3s. Further, during the extraction process, the oil is heated, which causes oxidative damage to the essential fatty acids. Damaged oil has a rancid odor that is disguised by deodorizing and bleaching it before packaging it for sale. In your body oxidized means damage to your cells and tissues. Do you know what happens when an apple is exposed to air? Oxidation is the process that turns it brown and makes it go bad. If you eat vegetable oils that are already oxidized from heat and light in processing, you are exposing your own healthy tissues to a volatile substance which will damage them. Oxidation, or rancidity, is not only a major contributor to most degenerative diseases, but also causes inflammation. Excess inflammation in the body can cause anything from arthritis to more serious diseases. such as Parkinson’s, bipolar moods, schizophrenia, and obsessive compulsive disorders. Healthy eating tip 6: GM Food? What is it? GM food is a big no when it comes to planning your healthy diet charts. 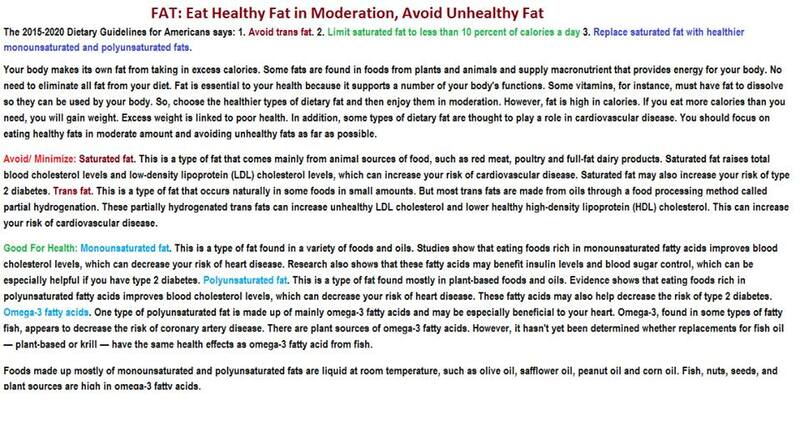 Healthy eating tip 7: Fat? How much of fat is too much? Is fat the only villain in our diets? Remember, you do not have to deprive your body of fat, which plays a crucial role in the cell formation and regeneration in your body. All you need to do is moderate its use. Healthy eating is not about eliminating fat from your diet. Elimination of fat could speed up your aging process and result in wrinkles, sagging of skin. 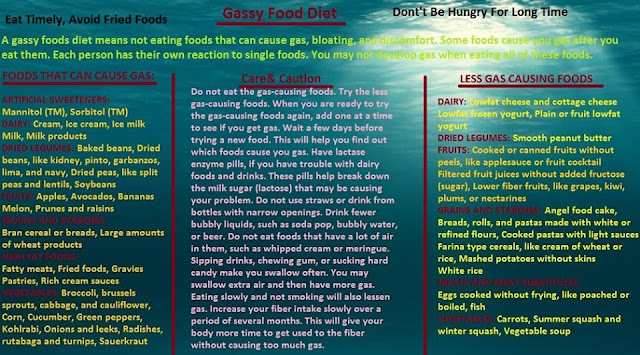 Healthy Eating tip 8: Common Gassy foods: Wondering which foods cause you bloating? What is a gassy food diet? Healthy Eating tip 9: Why An Oats Diet is Important? 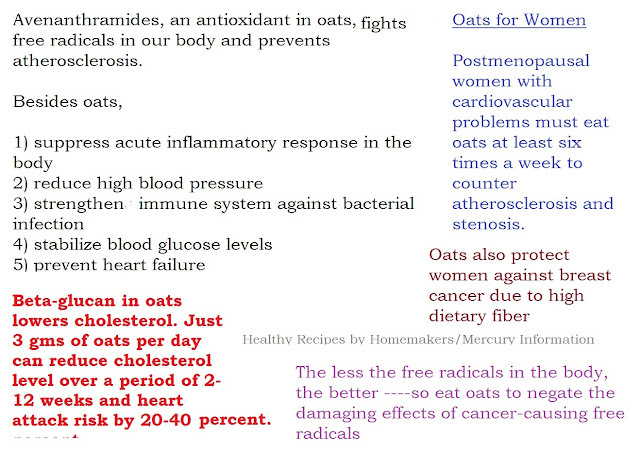 Why should you make oats part of regular diet? Some people try to avoid oats mistakenly believing that oats contain gluten. But what is the reality? 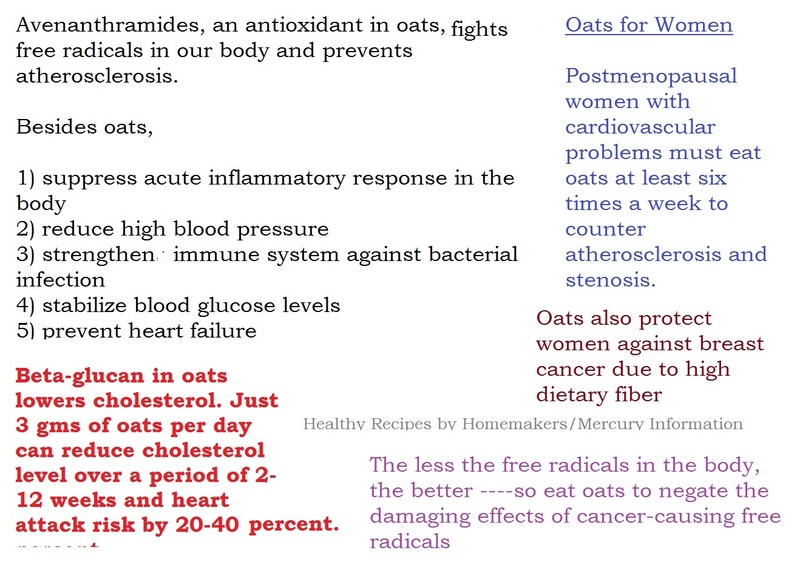 Oatmeal is loaded with benefits. It won't be wrong to dub it as another superfood. When you are planning your weight loss diet, oatmeal is a must-include ingredient in your healthy diet plan. You will be seriously surprised to see how you can include oatmeal in your healthy diet to lose weight, boost immunity (by getting your supply of antioxidants), get a strong digestive system, and stay fit with all the goodness of fiber, vitamins, minerals and nutrients loaded in oats. Here are some of my tried-n-tested healthy snacks from oats. Make oatmeal a part of your healthy meal and you would be better off than ever before. When looking for healthy food recipes, look for the value some of the spices provide to your life. 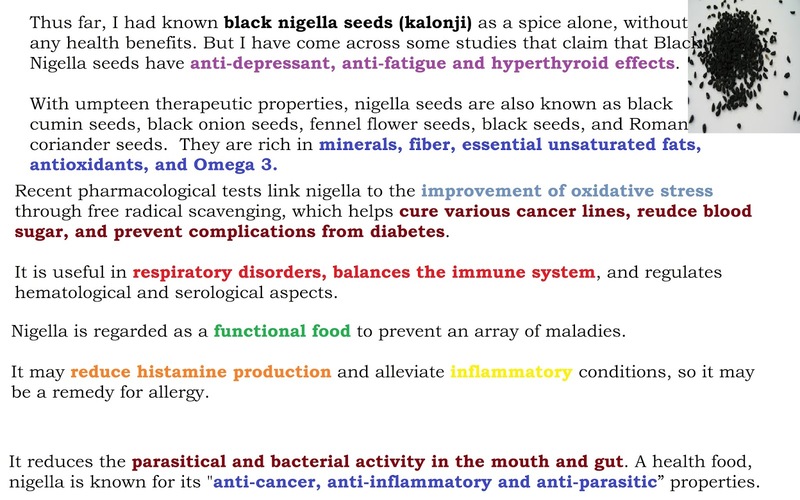 Nigella seeds are some of the less commonly used spices. In India, we commonly use this in pickles. In East India, especially West Bengal, nigella seeds are a more common part of healthy eating plan. How to Eat Healthy tips 11: What is Diabetes? What Causes Diabetes? Diabetes is not due to your sugar intake. It is a metabolic problem. As your body's metabolism is weak, it does not expend the calories you eat. Food high in calories tends to add more fat and weight, causing diabetes. Thus, sugar doesn’t directly cause diabetes, and you are more likely to become a diabetic if you are overweight. You gain weight when you take in more calories than your body needs, and sugary foods and drinks contain a lot of calories. It's important to add that fatty foods and drinks are playing a part in our expanding waistline. If too much sugar is causing you to become overweight, then you are increasing your risk of getting diabetes. Having diabetes doesn’t mean you have to cut sugar out of your diet completely. However, we are eating too much sugar …far too much… and harming our health as a result. Being overweight can make it difficult to control your diabetes and increase your risk of getting serious health problems. So eat sugar to the extent you are able to maintain your weight. Eat ice creams and walk vigorously for an hour every morning. You are free from any risk as far as BMI index is concerned. Instead of the usual chocolate bars, sweets, cakes and biscuits, make fruit your snack of choice. Try natural yogurt mixed with chopped fruit or a handful of nuts instead of your usual sugary fix. Try natural sweeteners in place of sugar. Type 2 diabetes, which comes first, is essentially a metabolism/ lifestyle problem. It can be tackled with exercise and diet only. If you do not follow a regular exercise regimen, it risks progressing to Type 1, where insulin cells in the pancreas are destroyed. In Type 1 diabetes, there is an inevitable risk of diabetes-related health disorders, including heart problem. So, you must kick-off your lethargic lifestyle and adopt a healthy living style by indulging in regular exercise and workouts. Today, inactive and lethargic lifestyle, in addition to unhealthy eating habits, are contributing to diabetes in children. Diabetes Miletus is diabetes affecting children. Identify the common diabetes symptoms in kids. Healthy lifestyle is all about eating in moderation, exercising regularly, enjoying a sound sleep for 6-8 hours a day, and remaining stress free. It is not about dieting or starving yourself, which could start ketosis or ketoacidosis in your body. Without physical activity, anything you eat (be it proteins, carbs, or sugar) will turn into sugar in the body and cause a spike in glucose levels, resulting in fat deposition and other health problems. Physical exercise and a balanced diet is the only solution to dealing with this metabolic disorder. You have got to take it seriously !!! How important are Proteins in a healthy diet? It should be 30 to 35% of diet – form of pulses, milk, leafy greens, eggs, white meat or sprouts. Protein is the main component of your body cells, hair, skin and soft tissues. Since men tend to be muscular and usually weigh more than women, they require more protein. You should have one helping of protein with every meal, in any form like whole dals, cottage cheese or gram flour or 30 grams of pulses. According to the Indian Market Research Bureau, 9 out of 10 people of the sample consumed inadequate amount of protein. This is due to the increasing consumption of convenience foods high in carbs and sugars and low in protein. Provide energy, store vitamins and synthesize hormones. About 1/5th of your diet or 20% should be devoted to fats of three kinds -polyunsaturated, monosaturated and omega-3 fatty acids. 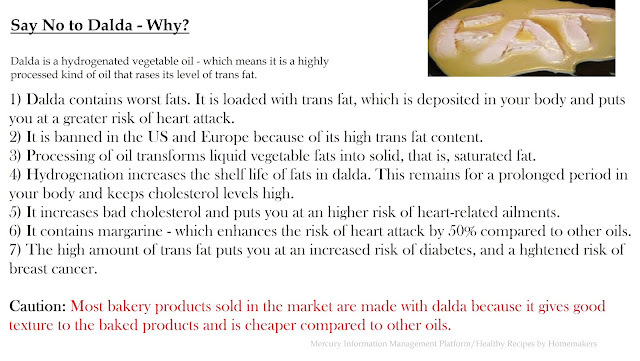 Vegetable oil used in day to day cooking is a major source of visible fat in our diet. 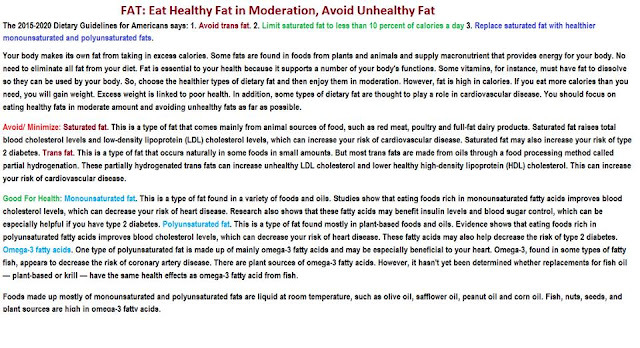 For optimal fat quality, the use of a combination of vegetable oils is important. It is suggested to have a good blend of various types of oils in your diet. You could juggle between butter, ghee, olive oil, mustard oil, soyabean, sesame or even groundnut oil for different meals. 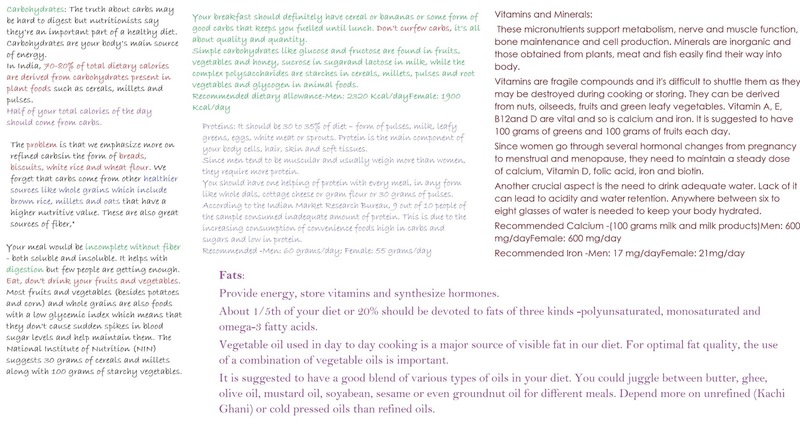 Depend more on unrefined (Kachi Ghani) or cold pressed oils than refined oils. When you are planning a diet for weight loss, keep a close watch on your fat intake. How Vitamins and Minerals affect healthy diet? These micronutrients support metabolism, nerve and muscle function, bone maintenance and cell production. Minerals are inorganic and those obtained from plants, meat and fish easily find their way into body. Vitamins are fragile compounds and it's difficult to shuttle them as they may be destroyed during cooking or storing. They can be derived from nuts, oilseeds, fruits and green leafy vegetables. 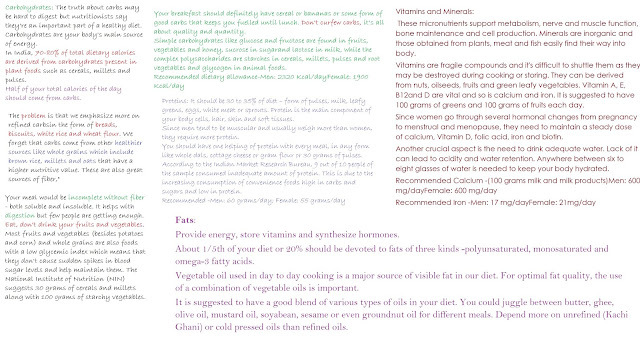 Vitamin A, E, B12and D are vital and so is calcium and iron. It is suggested to have 100 grams of greens and 100 grams of fruits each day. Since women go through several hormonal changes from pregnancy to menstrual and menopause, they need to maintain a steady dose of calcium, Vitamin D, folic acid, iron and biotin. Another crucial aspect is the need to drink adequate water. Lack of it can lead to acidity and water retention. Anywhere between six to eight glasses of water is needed to keep your body hydrated. Healthy Eating tips 14: Should infants be given cow's milk as a substitute to breast milk? 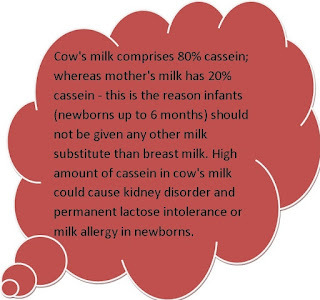 .Cow's milk comprises 80% cassein; whereas mother's milk has 20% cassein - this is the reason infants (new borns up to 6 months) should not be given any other milk substitute than breast milk. High amount of cassein in cow's milk could cause kidney disorder and permanent lactose intolerance or milk allergy in new borns. 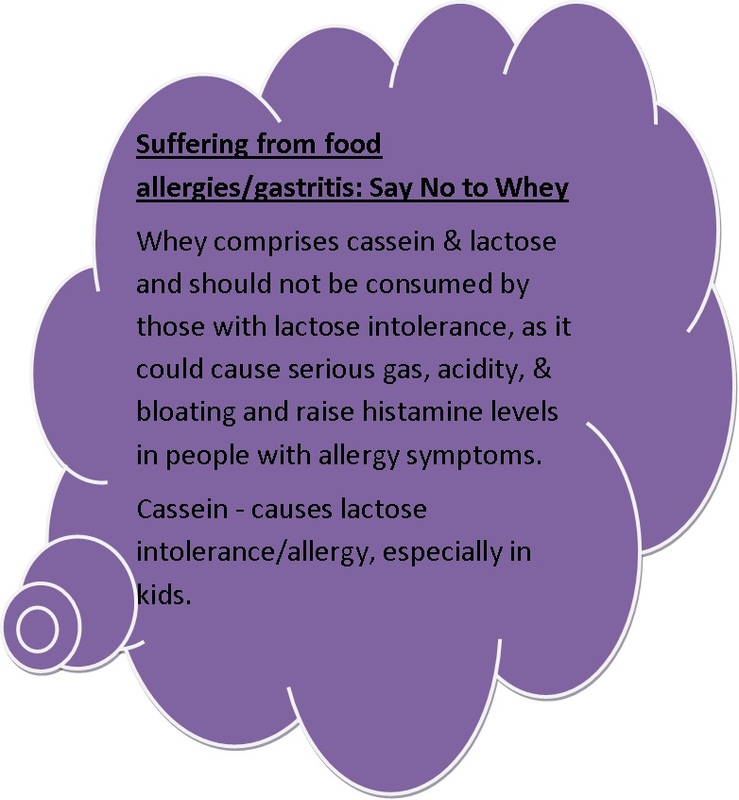 Whey comprises cassein & lactose and should not be consumed by those with lactose intolerance, as it could cause serious gas, acidity, & bloating and raise histamine levels in people with allergy symptoms. 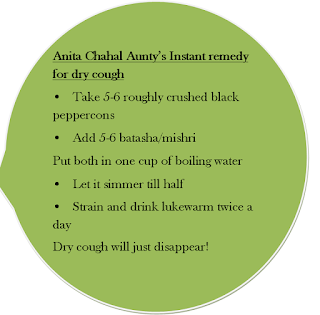 This home remedy for dry cough was shared by dear Anita Chahal aunty ji. 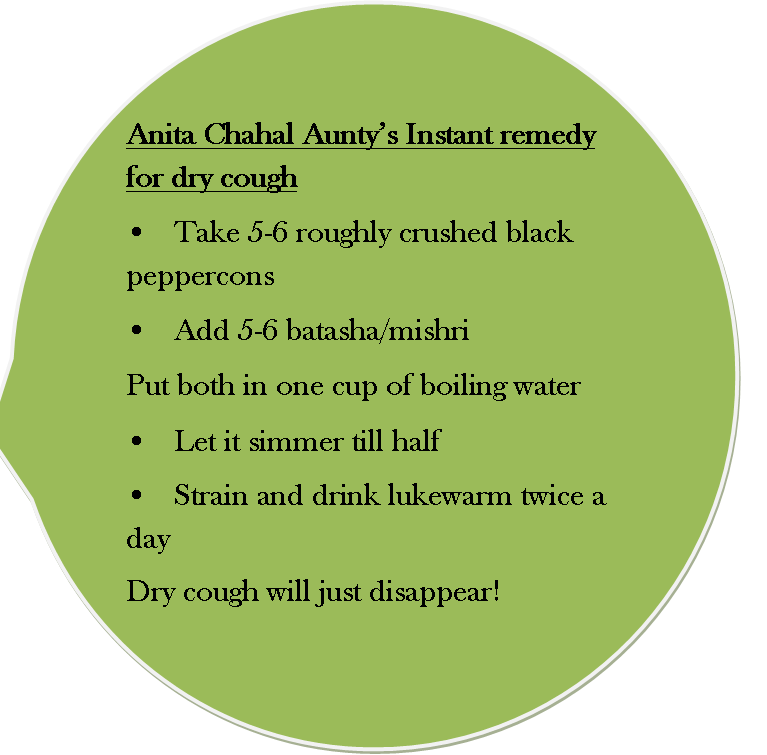 This is an age-old trick that works wonders on dry cough. Is any loved one suffering from cough symptoms? Here's the remedy. We always get panicked when fever sets up. But fever is the body's mechanism to make antibodies to suppress viral/bacterial strains. Fever is due to three factors - viral, bacterial, and protozoan. There is no match to natural remedies. Sure, no medicines need to be taken for viral infections.However, I have some reservations about bacterial infections. The body needs some form of supplement to suppress bacterial outgrowth. Honey, ginger, turmeric might help in bacterial infections. 1. Acrylamide is more in foods with high starch content which have been cooked above 120C and turn crisps. Usually food with more amino acid, sugar, and starch cause high level of Acrylamide when fried till it turns brown. So, avoiding deep frying starchy/ sugary food is the best option. Coffee is not a starchy food, it is naturally brown. We cook or not, it remains brown. Less sugar and starch in cakes/ cookies too help. 2. Bread, chips and potatoes should be cooked to a golden yellow colour, rather than brown, to reduce our intake of a chemical which could cause cancer. So avoid cooking them to brown. There are two things. 1. First includes foods that turn naturally brown, such as wheat flour, brown rice, parboiled rice, flour-made cookies, dal, etc. These are naturally brown when cooked and should not be considered harmful, as they do not contain starch. 2. Second is the group of foods that are highly starchy and have a natural sugar content. Potato, non-wholegrain bread, etc, belong to this group. These foods when cooked for longer take various colors, such as golden yellow, slight brown, dark, brown, and red. About cakes and cookies, if these are made from whole wheat flour, they are safe even if turn brown. But those made with refined flour (maida) are not good if they turn out to be dark brown/ red. Everything turning brown may not be a problem, because all food does not contain starch...the brown color may not be only due to the burning of starch or sugar, it may be due to fat or oil...limit the starch from browning too much .....this stands for just about anything - from cookies to cakes, from savories to fries, from chips to bread toasts ...all we can do is try not to overcook anything - that it gets over browned...a golden hue is still required to cook things perfectly; else, we would be eating them raw...or we quit eating everything..